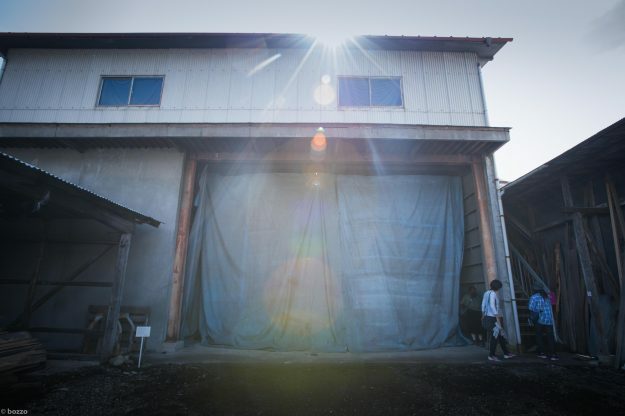 Set in Gunma prefecture, a mountainous area of eastern Japan, A Narrative of “Nature” is based loosely on the history of forestry in Japan. 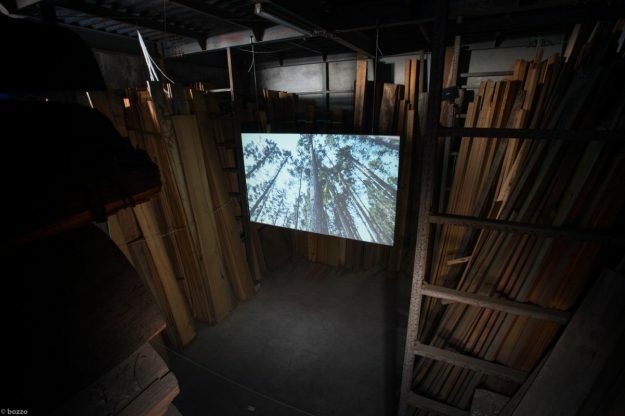 Presented as a two-screen video installation in the storehouse of a former wood merchants, the main protagonist in both films is the sugi tree, or Japanese cedar. 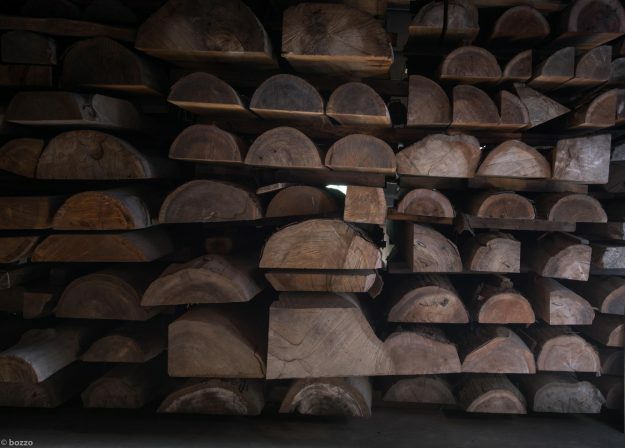 Long valued in Japan for its rapid growth and straight trunks that provide excellent timber, today swathes of the Japanese countryside are covered with sugi forests whose planting reached a pinnacle during the postwar period, causing an unnatural hegemony of species. 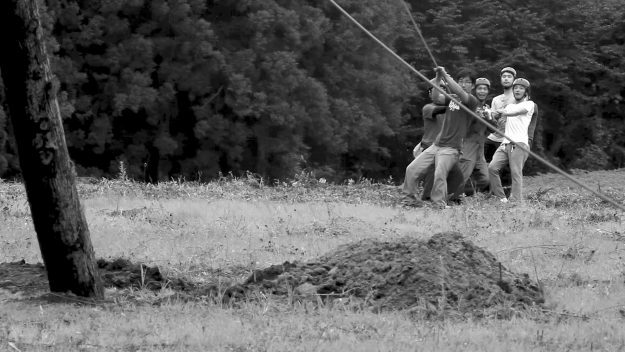 In the first film, seemingly “natural” scenes of forests are interrupted by trees that collapse without apparent cause. In the apparent absence of human presence, their yielding to the forces of gravity nevertheless suggests that the trees know their fate, giving themselves up to the hands of their planters. 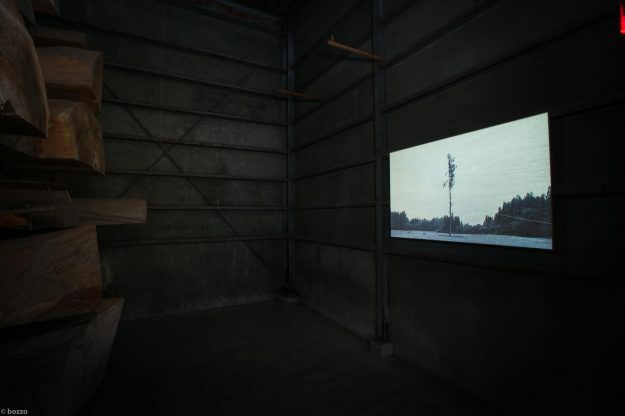 The sounds of wood splitting and heavy trunks thudding to the ground, mixed with the familiar sounds of Japanese forests in summer, can be heard as the viewer moves to the second film, a silent black and white sequence projected onto veneer board. 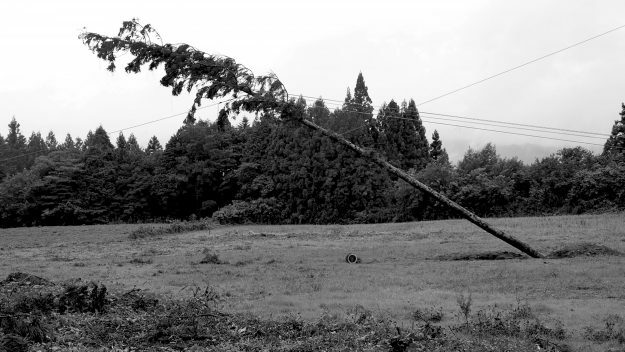 With the grain of the unpainted screen giving accent to the projected image, in this film the camera focuses on a single fallen tree, which is subsequently re-erected by human hands. Witnessed by the living trees around it, the human action here of trying to erect a 20-meter tall sugi tree that once stood freely is both poignant and farcical. After achieving the goal of returning the tree to its former magnificence, in the next instance it is felled by the same hands, shrouding the act in an awkward ambivalence. What might be viewed as a triumph of teamwork and human endeavor may on the other hand ultimately be seen as a human manipulation of “nature”.